Develop the Fundamentals: Strokes & Footwork. Here is the answer Paul gave, which is now published at Stump the Ump. Thanks for getting back to me. However, I don't think the ruling on this is that clear, based on the actual wording of the rules. The rules say the ball must rise at least 6". Suppose a player serves so that the ball leaves his hand exactly 40 inches above the ground. If the ball then goes up six inches, it has risen six inches, from 40 inches to 46 inches, and it would seem to have fulfilled requirements of the rule, regardless of what the serving hand does. Nowhere does the rule state that there must be six inches clearance between the hand and the ball - that's a common sense interpretation, but I don't see how one can get that from the wording of the rules. As noted, many umpires and players read the rule as it is written (and interpret it differently than what you wrote), i.e. the ball must rise six inches, and since it isn't indicated otherwise, they measure it from the point where it leaves the hand. Based on that, a player's serving hand could rise and stay with the ball, and still fulfill the requirements of the rules as they are worded as long as he doesn't use it to hide the ball, and as long as he quickly removes the serving arm and hand from the space between the ball and the net. If there is an interpretation that the ball must rise six inches relative to the hand - which would be difficult to justify, based on the wording of the rule - then that needs to be published somewhere so as to remove the confusion. So what do you think? Is there anything in the actual rules that state that there must be six inches of separation between the hand and the ball when serving? I don't see it. All I see is that the ball must rise six inches, and I don't see how that is affected by the location of the serving hand. I'll go by this interpretation even though I don't really agree with it. I haven't received a response yet from Roman Tinyszin (chair of the USATT Officials and Rules Advisory Committee) or Wendell Dillon (former chair). Have a rules question? Feel free to ask me. If I can't answer it (impossible!!! ), then we can submit it to Stump the Ump. As I blogged about on Friday, the episode of Veep that would "feature" table tennis was on Sunday night. Alas, while there was some recreational table tennis, all the scenes with the three top players I'd brought in were cut. However, in most of the scenes taking place at the fake Clovis corporation - about half the episode - I'm often standing just behind the camera or off to the side, out of view, watching it as it is filmed. Here's the article, where he explains why he wants to deal with the "China" crisis, and will remain involved in the newly created position of ITTF Chairman. Here's the article and info for this annual $1250 scholarship. Here's the video (52 sec, including slow motion replay). Maze is on far side (lefty). This'll wake you up before you move on! Here's the home page for the ZEN-NOH 2014 World Team Championships, April 28 - May 5, in Tokyo, where you can find results, articles, photos, and video. It starts today. Since Tokyo is thirteen hours ahead of us, all of the first day action should be complete already. (So 9AM east coast time is 10PM Tokyo time.) Here are more articles involving the Worlds. Men's Video Update #1 (1:37) by Jim Butler (before play began). Women's Video Update #1 (43 sec) by Lily Zhang (before play began). Day One Results (do search for "USA"): USA Men went 2-0, defeating Luxembourg 3-1, and Kazakhstan 3-2. USA Women were apparently in the middle of their first tie, and were listed as 1-1 with Hungary, so by the time you read this that'll probably be done. Here are the photos - click on the photos to see more. My Passion for Sports and the State of "Flow"
Here's the new article by Dora Kurimay, sports psychologist and table tennis star. Here's a video (10:11) where they demonstrate and explain (in Chinese) their serves. Even if you can't understand the Chinese you can watch the serves themselves. About halfway through they start showing other players doing other shots. Here's the video (3:27), where he talks about his table tennis and shows him playing. Now that's a unique paddle! I want one. Especially the swimming pool part. Artwork by Milan Mirkovic. Here's the cartoon! So Beetle has learned to serve with heavy backspin? Here's the cartoon! Now I'll never look at our own junior program the same way. Here's a hilarious video (1:12), showing Michael Maze and Dimitrij Ovtcharov in an "epic" match . . . sort of. POINT 1: Fan does reverse pendulum sidespin serve short to FH. Cho comes in with FH as if receiving down the line, freezing Fan (who has to cover for the down-the-line shot), and then drops it short the other way, to Fan's FH. Fan steps in, threatening to go very wide to Cho's FH, instead flips down the line to Cho's BH. Since Fan is leading over table, Cho attacks very wide to Fan's BH. Fan has to move quickly, and does a safe backhand topspin to Cho's wide BH. Cho spins off bounce to Fan's wide BH. Both players are trying to avoid the other's FH, and since these aren't highly aggressive shots, they are going wide to the BH rather than the middle, where many attacks go. After his previous backhand loop, Fan is moving back to ready position and is caught slightly when Cho goes right back to the wide backhand. As Fan moves to do an awkward backhand loop, Cho steps around to counterloop with his FH, but Fan BH loops off. Point to Cho. POINT 2: Cho does FH reverse pendulum serve to Fan's BH. Fan backhand banana flips, but his shot nicks the net and goes off. I can't read the spin from this angle (Cho's body is in the way), but while the obvious thought was the serve was backspin, I suspect it was no-spin from the angle of Fan's racket. His contact with the ball is almost directly behind it; if the ball was heavy backspin, he'd be going more around it with sidespin rather than go up against the backspin directly. (That's a secret of the banana flip.) Point to Cho. POINT 3: Cho fakes a regular pendulum serve, but does another reverse pendulum serve. It's half-long to the FH, barely off the end, and Fan loops it rather weakly. But since Cho has to guard the wide FH angle, he's slow in stepping around, and so he takes the ball late and goes off the end. Point to Fan. I'm guessing Cho hasn't gotten his rhythm yet or he'd make that shot, even rushed. POINT 4: Fan does a regular pendulum serve. The motion looks like he's going long to Cho's backhand - watch how Cho starts to step around. Instead, Fan serves short to Cho's FH, forcing Cho to change directions. See how off balanced he is as he receives? He manages to drop it short, but is still a bit off balance as he steps back, and so is slightly caught when Fan drops it back short. He does a weak backhand attack, which Fan easily backhand loops. Since Cho is leaning over the table with his backhand side a bit open, Fan goes to his wide backhand, forcing Cho to block. Fan now does a stronger backhand loop to Cho's middle, forcing a weaker block, and then Fan steps around and rips a FH to Cho's middle. The whole point was like a chess match, where a small advantage is gradually turned into a winning point. Point to Fan. POINT 5: Here's where Fan apparently pulls a fast one. He does a pendulum serve, but it looks like he's hidden contact - but just barely. Here's an image just before the ball disappears behind his non-playing arm, and here's one just after, with the arm now hiding the ball. Can Cho see contact? Most likely contact is hidden, but becomes visible the split second afterwards. Here's one the split second after the arm gets out of the way, where you can see the ball against the racket. It happens so fast it's almost impossible to be sure, but it looks like he contacted it with a regular pendulum serve, heavy backspin, but hidden by the arm, and then, the split second after, as his arm moved out of the way, his racket moves slightly in the other direction as if doing a reverse pendulum serve with sidespin. That's what Cho likely saw, and so he backhands the ball right into the het. (This was the standard technique at the high levels before hidden serves became illegal - hide contact, but show the receiver a fake contact the split second afterwards to mislead them.) Point to Fan. Was this last serve legal? You decide. Here are the pertinent rules. 2.06.04: From the start of service until it is struck, the ball … shall not be hidden from the receiver by the server or his or her doubles partner or by anything they wear or carry. 2.06.05: As soon as the ball has been projected, the server’s free arm and hand shall be removed from the space between the ball and the net. The space between the ball and the net is defined by the ball, the net and its indefinite upward extension. 2.06.06: It is the responsibility of the player to serve so that the umpire or the assistant umpire can be satisfied that he or she complies with the requirements of the Laws, and either may decide that a service is incorrect. Back on October 10, 2013, I blogged about spending a day on the set of the HBO TV show Veep. Well, the episode, "Clovis," airs this Sunday, at 10:30 PM in my area (east coast). I was basically their table tennis advisor, and I brought in three top table tennis players who should appear in the episode: Khaleel Asgarali (2314), Qiming Chen (2221), and Toby Kutler (2154). See the blog entry for info on what we did. So you can recognize them, here's a picture of Khaleel Asgarali. Here's Qiming Chen (on right). And here's 14 seconds of Toby Kutler doing multiball training. Here we go again. Last night during a class I was teaching I demonstrated a forehand smash. I thought something felt funny in my right knee afterwards, but it wasn't until about ten minutes later that my knee started to act up again. And now I'm limping about, hoping I can coach. (I have a 90-minute session tonight, so it's not a busy night, but then the weekend is very busy.) This is not a good thing for an active coach. On the other hand, it's been a while since my knees/arm/shoulder/back acted up. I've had problems with both knees. When it's my left, I can usually compensate better, but my right knee is my push-off leg for all my forehand shots, plus it's hard to move to the right when it's acting up. We'll see how it is when I coach tonight. Here's video (1:26) of the most intensively serious workout they've ever undergone, and some chitchat. And here they are relaxing and playing cards. Here they are on the subway returning to the hotel. Here's the video (6:38) by videomaster Jim Butler. This one covers Eric Boggan, Dan Seemiller, Jim Butler, Sean O'Neill, Hank Teekaveerakit, Attila Malek, and Lily Zhang. Here's an article on the use of ping-pong balls to send things into the upper atmosphere for scientific experiments. Last Thursday I blogged about my day on the set of the HBO comedy "Veep." I was only there on Wednesday - for 13 long hours. The episode featured table tennis, and I went in originally as one of the table tennis players - but they wanted only players in their 20's, and so I was relegated to being a possible extra as a janitor - but they didn't use me, alas, as even there they wanted people in their 20s. On Thursday they did the actual table tennis scene. I wasn't there, but Toby Kutler told me about it. 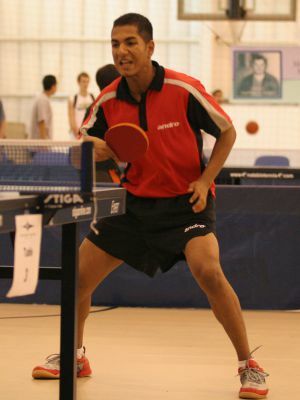 He and Khaleel Asgarali were the real table tennis players in the scene. (Qiming Chen was there the day before but wasn't there on Thursday.) Two actors who - falsely - claimed to be good table tennis players were also used. Toby said that he was originally told that he and Khaleel would be playing, and that he would accidentally smack a ball that would hit star Julie Dreyfus, that he'd get to speak a line "Sorry about that," or something like that), and that she and her aides would all get angry and start screaming at him and the other players, and tell them to leave. However, there was a last-minute directorial decision to have them play doubles, and so the two actors who said they could play were added, meaning the rallies were much weaker. One of the others than had the honor of hitting the ball that smacked Dreyfus, and there were no speaking lines from the real TT players. Also, the players didn't actually hit her; they used a ping-pong gun to shoot a ball at her instead. The table tennis episode is Episode 3.3, the third one of season three, and will air in March or April of 2014. Toby, Khaleel, and Qiming will be seen in the episode not only as TT players but as workers on a computer and walking by, possibly in several scenes. Here's an article from yesterday's Washington Post (though it apparently appeared first in the LA Times) about Einstein's brain. It references a technique developed by a Chinese physicists for "measuring the thickness of the corpus callosum in Chinese table tennis players, whose sport requires remarkable feats of inter-hemispheric coordination." Here's an article from the Wall Street Journal that references table tennis as an example of where China is good at innovation, while explaining why, in general, it is not. "To understand why China has such a tough time producing world-class innovations, take a look at how the Chinese play games. Ping pong tables are everywhere in public spaces and open to all comers, from kids to agile retirees, producing a reservoir of talent that has made China a ping pong innovator and champion. By contrast, basketball courts in China are generally locked up. Entrance is controlled by the state—in this case, school officials—shrinking the talent pool and the chance for youngsters to hone their moves. The result: basketball mediocrity." Here's an article with a link to a video (1:27) of a nine-year-old's ping-pong ball trick shots. Pretty impressive for any age! I moderated the infamous "Religion and Politics" panel, which can get rather heated, but we managed to keep it mostly low-key this time around - much of the discussion wasn't about actual religion or politics, but about famous religious or political novels and movies that influenced the world. This was a good fit for me, as many of my short stories and both of my novels (one coming Nov. 15, the other in a state of flux as I do a rewrite for a publisher) are political. I sat next to the famous James Morrow during the panel. It's the second time I've been on a panel at a convention with him. I also moderated the panel on "Amazon - Good or Bad?" I had to great moments in this panel. At the start, after we introduced the panelists, I said, "I have some disturbing news. Some of us who really hate Amazon have gotten together and formed an Orange Crush Party." (I held up a can of Orange Crush that I'd just picked up from the con suite.) "We demand that Amazon be closed down immediately. Otherwise, we will defund and close down Capclave. There will be no more panels, the exhibits and dealer's room will be closed, and all parties are cancelled." At first people in the audience thought I was serious, but they figured it out and laughed at the end. I also did a stunt where, right there on stage, I bought a book from one of my four fellow panelists on my Kindle. I also explained my experiences with Amazon in selling my TT books. One surprise - I thought most of the people would think Amazon was bad, as they continued to use it, but the general consensus - with a few notable exceptions - was that Amazon was good. I was also on the "1001 Uses for an Unsold Story" panel where we talked about the possibilities - rewriting it, reusing the central ideas of the story in another story, using it in a novel, or just saving it for the appropriate anthology that might someday come along. Or printing it out to line your parakeet cage. I did a 25-minute reading on Sunday, where I read an excerpt from my upcoming novel, "The Giant Face in the Sky." I also had time to read my "cult classic" story, "The Bat Nerd," about a bat that thinks it's a superhero. And I got to meet and shake hands with George R.R. Martin, author of the Game of Thrones novels, now an award-winning HBO series. Plus I attended a number of panels and readings, and spent much time in the dealer's room, where I ended up buying only two books somehow. Here's a Guest Posting by Des Preston that I found interesting - and I agree with it. It comes at a timely time since (as noted above) I'm leaving at 6AM for the Veep posting. I love the tips you give to your readers and I'd like to share one that I often remind myself of. A lot of intermediate-advanced players 1800+ spend too much time thinking of their own technique/form during matches. At the 1800+ level, unless you are purposely trying to fit a certain shot into your game, constantly reminding yourself of your own technique can be a hindrance. To help me pay more attention to my opponent and less time watching myself I switch the wording around in my head. If I miss a shot or make a weak return, instead of saying, "Open your paddle more" or, "C'mon swing like this! ", I think to myself, "Ok his serve has more backspin on it than I thought," or "His blocks are mostly dead." This way I'm thinking more about their shots, and letting my own subconscious figure out how to handle it. At a lower level this may be difficult, but once a player has all the shots they need in their arsenal, this might be a better way to think. It's less taxing on the player's mindset as well. I feel like I'm not blaming myself, I'm just pointing out that the other player did something I wasn't expecting. Here are the articles from Table Tennis Master: Part 1 and Part 2. Here's the article. "The Houston Rockets recently spent $7 million upgrading their locker room as they enter the beginning of the James Harden-Dwight Howard era and it seems like table tennis playing General Manager Daryl Morey had at least a little bit of an influence since the locker room features table tennis." Here's a video (4:31) with a compilation of hilarious and spectacular play, much of it exhibition, and set to music. It's from 2010, but I don't think I'd ever seen or posted it.